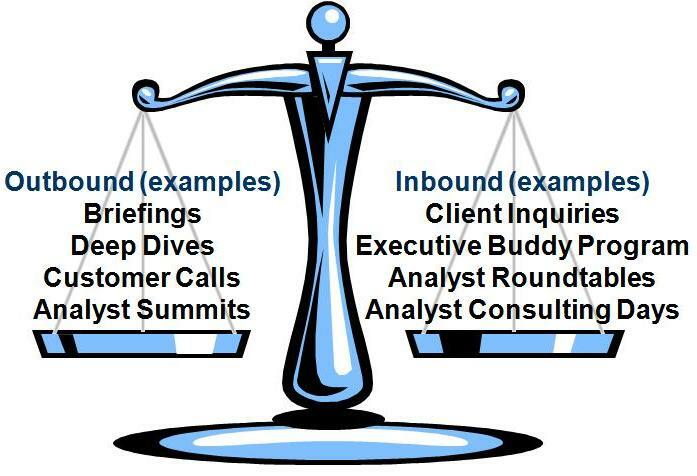 One of the biggest mistakes that an analyst relations (AR) team can make when trying to influence an industry analyst is focusing too much on outbound communications (e.g., briefings) and not using inbound interactions (e.g., client inquiry) enough (click to enlarge graphic). Analyst relations (AR) is typically interrupt-driven so it is easy to get caught up in responding to analyst requests and getting ready for the next briefing. Unfortunately, this leads to a situation where some of the most effective tools AR has are not taken out of the toolbox. To correct this problem, AR teams need to make it a priority to balance inbound and outbound interactions. SageCircle suggests an interaction plan that creates a schedule based on internal and external triggers. (We have details and a sample spreadsheet in the Online SageContent Library). This allows you to easily review the balance of planned interactions for type, tier, and focus. By creating this forward-looking plan you can better schedule your spokespeople, get ahead of critical briefing needs, and better utilize your contracted inquiries. Bottom Line: One of the best ways to “get inside the head” of analysts is using client type interactions. Client interactions, especially inquiry, are also critical to impacting the top of the Analyst Hierarchy of Needs. By making the review of interaction mix a regular activity, AR teams can ensure they are using all the tools available to them. Question: Do you have a ratio of inbound to outbound that you try to maintain? If so, what is your ratio? What process do you use to ensure that you are achieving your goals?